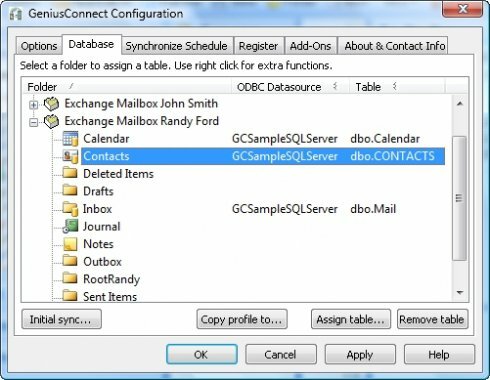 GeniusConnect turns Outlook or Exchange into a more powerful information management tool through database connectivity! -Improved efficiency while working in Outlook through immediate access to current database information. -Easy access to contact, calendar and customer information, stored in your database. -Create Tasks in Outlook based on events in your database. -connectivity to any standard SQL Database. A folder (Calendar, Contacts, Mail, Journal, Notes and Tasks) can be linked to a database table. Qweas is providing links to GeniusConnect 64bits 5.0.0.6 as a courtesy, and makes no representations regarding GeniusConnect 64bits or any other applications or any information related thereto. Any questions, complaints or claims regarding this application GeniusConnect 64bits 5.0.0.6 must be directed to the appropriate software vendor. You may click the publisher link of GeniusConnect 64bits on the top of this page to get more details about the vendor.